Corfe Castle has to be one of the most photographed icons in Dorset but little did I know how much just two images (one planned and the other very much by chance) would have on my photographic portfolio. In 1981 Roger Holman and I were commissioned by the National Trust to produce an audio-visual presentation entitled ‘The Greatest Gift’. This was to be the story behind the largest gift of land the trust had at that time been given. Bequeathed by landowner Ralph Bankes following his death in 1981, the Kingston Lacy Estate included twelve working farms and the ruins of Corfe Castle. An iconic image of Corfe Castle was needed and I decided to travel to Corfe Castle whenever the weather permitted, early on successive autumn Sunday mornings in order to arrive before sunrise. Deciding to photograph the ruins from the west hill with a chance of morning light highlighting the ruins from the east, all I had to do was set the camera on a tripod and wait for that moment. That elusive moment took no less than five Sunday morning trips and the fifth morning it was pure magic complete, with golden autumnal light and rolling mists across the hills in the background. I took a series of images before the effect diminished and the sun became too bright, but I captured the atmospheric shot I wanted. 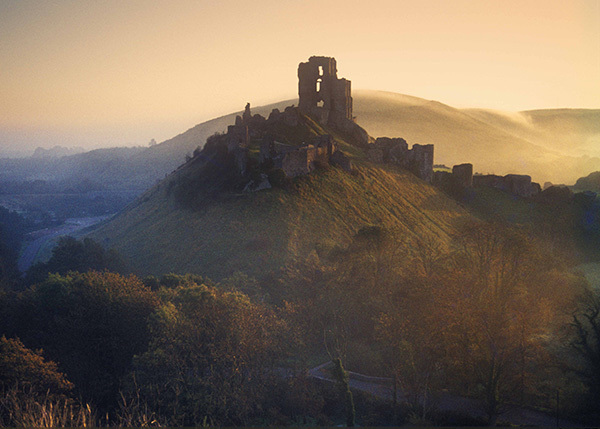 This image has since appeared in many magazines and books and has also formed the backdrop of an exhibition stand for Dorset Tourism. But the story didn’t end there. 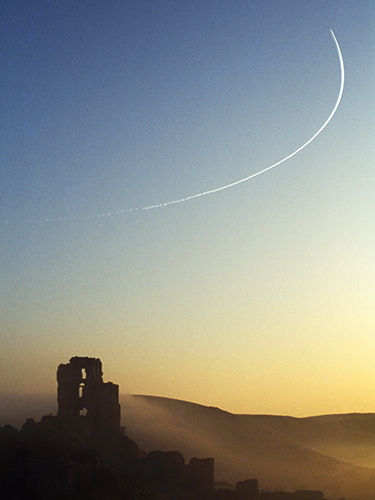 After packing the camera away and dismantling the tripod I started to descend the hill when I noticed an aircraft circling above the castle ruins, producing a jet trail in the clear morning air above the castle. I just had to capture that moment and grabbed the camera from the bag (an Olympus OM1 fitted with the standard 50mm Zuiko f1.8 lens) and managed just one hand-held shot as the jet trail began to disperse. That chance image has been one of my most successful and is hanging on walls around the world from UK to Norway, Australia and the USA. In fact a lady who saw it in an exhibition bought it for her son who was brought up in Corfe Castle, later to become a pilot with the Royal Australian Air Force.